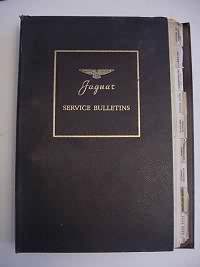 Jaguar produced a large number of Service Bulletins from 1946 through into the 80s. They are not readily obtainable complete although copies (sometimes bound in their original Jaguar binders) do surface in Auctions, including eBay. However, to be assured that what you are buying is complete, never purchase sight unseeen. Condition of the earlier ones is often very poor. Jag-lovers cannot reproduce the original bulletins for Copyright reasons but they are now available on CD-ROM via the JDHT at low cost. We do however have some useful summary information available provided by Jag-lovers list members. Currently these resources cover 1946-1959 only (i.e. SS Cars/Mark IV and the XK120-150 series). The table below lists what we currently have and the formats available. Please note that this information is for personal use only and is not to be reproduced for any commercial purposes whatsoever. All original Service Bulletin material remains Copyright Jaguar Cars Ltd, England.